#19 DePaul beat Northern Illinois 65-46, and gave Blue Demons Coach Doug Bruno his 500th win. Nnemkadi and Chiney Ogwumike each posted double-doubles to lead #4 Stanford in smashing UCLA, 77-50. Some other spots in the Pac-12 were hot today - especially in Oregon less than an hour ago. It took two overtimes, but Washington State prevailed over Oregon State, 61-54. Colorado had to come back to overcome Utah, 58-52. The Buffs remain unbeaten. Arizona State bested Arizona, 60-45. And in the other Southern California, it was USC over Cal, 74-54. Twenty-two teams start 2012 off with a game tomorrow, including #6 Kentucky, #8 Tennessee and #24 Gonzaga. Like many do this time of year, I've been reflecting this week, and I can't think of too many things that make me happier than basketball. I have a good feeling about 2012 hoops. I've never been one for end-of-the-year reviews, so I'll let Mechelle Voepel and Brenda VanLengen discuss it. David Siegel and Angela Taylor also have a good take on 2011. For me, the basketball year began wonderfully with an exciting NCAA Final Four. Then Pat Summitt's announcment made the landscape turn bleak. Three weeks later came the devastating killing of New York high school basketball star Tayshana Murphy. Then the WNBA Finals series was thoroughlly enjoyable. Six weeks later, Kurt Budke and Miranda Serna died. Just seconds ago, UCLA prevailed in a hard, hard-fought game over Cal, 60-55. From my witnesses, it was a hell of a thing down the stretch. Looking forward to seeing the write up on that one. Stanford pulled away from USC to win, 61-53. Oregon State, now 10-2, boosted that record by defeating Washington 60-55. Washington State blew Oregon out, 75-47. Chamique Holdsclaw had a tremendous gift for Coach Pat Summitt: a collection of 60 letters from former players and managers detailing what she's meant to their lives. Summitt called the gift "unbelievable." USC plans to fight on after the loss of Jacki Gemelos to injury. Dishin & Swishin interviews Geno Auriemma's daughter Alysa. Seimone Augustus is the Minneapolis Star-Tribune's sportsperson of the year. Big Ten, Pac-12 will "grow schedules together"
Some teams came back from the break today without missing a beat. Surprise upset: Middle Tennessee upset #6 Kentucky 70-58. #3 Notre Dame began their romp of Longwood with a 27-0 run. Devereaux Peters put up 19 points, and in the process eclipsed the 1,000-point mark for her career. There are 82 games tomorrow (!!). Including the beginning of Pac-12 play. "Guru" Mel Greenberg names his top stories of the year, which include Pat Summitt's announcement that she has early-onset dementia, the death of coaches Kurt Budke and Miranda Serna, the annual coaching carousel, and more. Helen has a great list of links previewing each NCAA conference, as play begins this week. Elena Delle Donne is back to superstar form for Delaware. Louisville's Becky Burke is more than "big shot Becky." Tennessee assistant coach Mickie DeMoss broke her arm and sprained a finger on the Vols' recent road trip to California. More women are moving into college athletic departments. Seventy-five colleges are objecting to a multi-year scholarship plan. Mechelle Voepel, Beth Mowins, Debbie Antonelli, Michelle Smith, Wendy Parker and Doug Feinburg discuss rule changes, conference realignment and outlooks for the rest of the NCAA season. Dayton's Justine Raterman has not only come back from an ACL tear last March, but she's stronger than ever. Raterman said the key to her comeback is staying positive. There are only four games scheduled for tomorrow. There are 59 games Wednesday. Most teams begin conference play this week. On the high school tip, ESPN ranks their top stories of the year. It's quite possible you didn't know just how smart Skylar Diggins is, until you read this great story about her. ESPN calls it a balancing act. Suzie McConnell-Serio is the pride of Pittsburgh, says ESPN. This week, Dishin & Swishin talks to Maryland Coach Brenda Frese and Kentucky Coach Matthew Mitchell. St. Mary's took the Smith Division, beating Riverdale Baptist. La Jolla Country Day won the Anderson Division. Oh, how I loathe and detest player injuries. Louisville senior forward Monique Reid will miss the rest of the season with a (non-ACL) knee injury. Stanford freshman guard Jasmine Camp is out for the year with a foot stress fracture. She had become a starter. In the Joe Smith Division, it'll be Riverdale Baptist vs. St. Mary's, which ESPN says is "a dream match up." The John Anderson Division will see two very different teams face off in La Jolla Country Day vs. Maryland's Academy of the Holy Cross. Malibu - USC surged in overtime to beat Pepperdine today, 75-71. The Trojans came in at 4-5, after losing two games by a total of three points on their recent road trip to Arkansas State and Texas A&M. Pepperdine was 5-5 entering the matinee, also losing its last two games, to Oregon State and UC Santa Barbara. This was USC's first game since losing star guard Jacki Gemelos to another ACL injury Sunday during the TAMU game. Gemelos was at today's contest to support her teammates. The Trojans now have eight healthy players. The game went back and forth for most of the first half. Neither team had more than a five-point lead until late in the first half, when Pepperdine went up 40-30, but USC was able to narrow the lead to 42-35 at the half. The Waves hit an amazing 8 of 11 from outside the arc (72 percent), with Lauren Bell hitting for four three-pointers and 18 points in the period. Trojan scoring was spread out among several players, and all eight players played and contributed in the first half. USC came out early for warmups for the second half. At eight minutes to go, the Women of Troy were on the court running drills. With about two minutes left, the team stopped their warmups and gathered under the basket. It looked like each player had something to say to pump the team up. The Trojans then came out and scored the first 10 points of the second half to take a 45-42 lead. It also appeared they were taking their game inside, as forwards Cassie Harberts and Christina Marinacci were both posting up to take shots. Ashley Corral and Briana Gilbreath were both moving the ball inside (Gilbreath finished the game with nine assists). The Waves were having difficulty defending Harberts, who finished with 23 points and nine rebounds. Stephanie Gilbreath played 27 minutes and had 10 points and seven rebounds, which was great to see after the injuries she has sustained. Pepperdine missed all nine three-point shots that they took. After USC's initial run, the lead changed hands a few times, but neither team could open up a lead bigger than four points. Both the Trojans and Waves had a chance to win the game in the last 15 seconds, but both squads missed their shots. Pepperdine scored the first two points of overtime and then couldn't hit again until around 30 seconds left. The Trojans able to open up a five-point lead in the extra session, and were mostly able to keep that lead at two posessions. Harberts scored six points in the extra period. USC out-rebounded the Waves 52-33. Both teams will begin conference play next week, when they return from holiday break. Jacki Gemelos dribbles the ball while her teammates shoot around before the game. The Trojans run through warm ups. 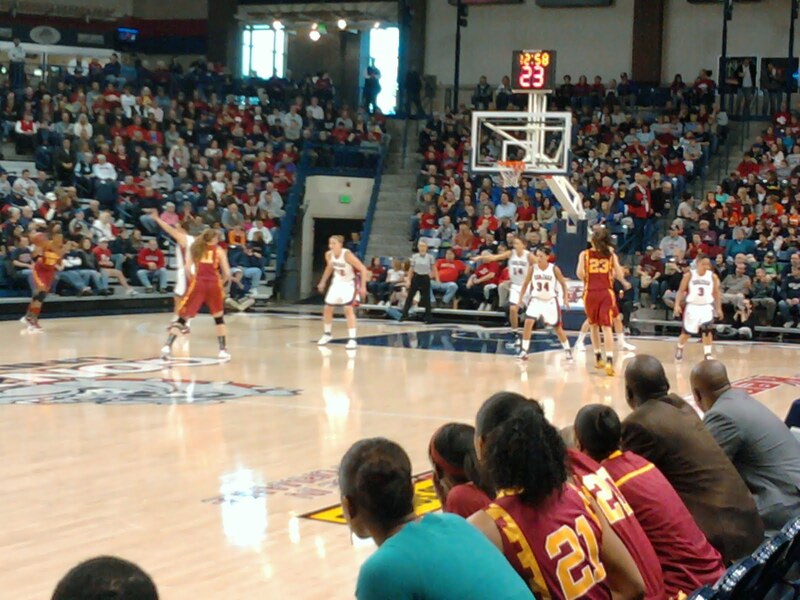 USC's Christina Marinacci vs. Pepperdine's Jazmine Jackson in the second half. 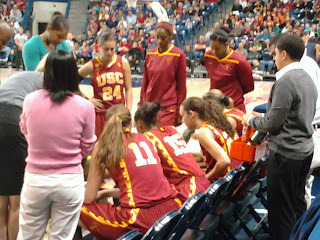 Just before the start of the second half, the Women of Troy called their own player's meeting under the basket. There appeared to be a lot of tough talking in the huddle. In case you missed it last night, Nnemkadi Ogwumike went nuts last night in Stanford's win over Tennessee: the forward had 42 points and 17 rebounds. Is it too early to call her player of the year? It was also the Cardinal's 68th consecutive home win. Speaking of big things poppin', "we back Pat" T-shirts have been selling at record pace. On the sad news tip: only 13 years for the woman who killed former Oklahoma star Rosalind Ross. True strength: St. Bonaventure freshman Tatiana Wilson's home burned down last week, and her mother and two siblings sustained major injuries. But she is persevering. Kelli Kingma, sister of Kristi, has committed to Washington. I used the SOS rankings from Saragin rankings: http://www.rpiratings.com/womrate.php. The numbers in the bottom chart reflect the team, the SOS/National Ranking, based on SOS only. I then ranked the Pac-12 teams based on their SOS National rankings. USC had the strongest SOS of the Pac-12 teams and Colorado the lowest, at 331. These rankings were done before tonight's games, thus Stanford's SOS will get stronger after playing Tennessee. Cal's should go down based on playing unranked Dartmouth. Five teams have played very good SOS's: USC/4 ; Stanford/9; Cal/26; Wash St/29 and UCLA/37. The rest are over 100. USC guard Jacki Gemelos did indeed tear her left ACL in Sunday's game against Texas A&M, the Trojans announced two hours ago. Gemelos is going through a range of emotions, as she faces the end of her college career. But she said today she will rehabilitate from her fifth ACL reconstructive surgery and play again. Although the diagnosis was just confirmed Tuesday, she said she knew immediately that her season, and college career, was over. "I knew right when I came down," she said. "The tears, the screaming, the slamming the floor, that wasn't because it hurt. "I'm so mad. I've never been more mad at an injury than this one. This time around I'm more mad than I am sad, which is saying a lot. The main upsetters may be meeting up by the end of the week. Yesterday's stars include two from Los Angeles and the Cal Sparks club team. Can Mater Dei defend their championship? Should Tennessee commit to Holly Warlick, too? UT should name associate head coach Holly Warlick as its coach in waiting, making it clear that whenever Summitt steps down, her former point guard and longtime assistant would step up. It's clear that Warlick, who has been with the program 35 years as both player and coach, will be the heir to the throne. But should Tennessee take this step? What do you all think? Gonzaga upset #12 Georgia tonight, thanks to a Haiden Palmer last-second three. Final was 71-68. The annual Stanford-Tennessee showdown is tomorrow at Maple Pavilion. This year they're ranked fourth and sixth, respectively, and the battle promises to be epic, as usual. The game was sealed with a handshake. The ESPN staff has been tweeting from the Tournament all day, aka day one. Their stories won't be posted until way after I go to bed, but they cast their bracket predictions this morning. No official word from USC yet on the senior forward's injury yesterday, but I have heard the news is not good. #1 Baylor rallied from behind to beat #2 UConn 66-61. Brittney Griner was the difference for the Bears, with 25 points and nine blocks, which broke the Big 12 career record, previously held by Oklahoma's Courtney Paris. #3 Notre Dame handed #7 Kentucky its first loss of the season with a 92-83 win. Interesting blowout: South Carolina over #16 North Carolina, 79-48. North Carolina survived a run by #18 Vanderbilt to upset them, 66-59. COLLEGE STATION, Texas — Southern California coach Michael Cooper cried during his postgame news conference — an injury to a star player caused the tears, rather than a tough defeat. Senior guard Jacki Gemelos might be done for the season after hurting her left knee late in the first half of Sunday’s 71-70 loss to No. 10 Texas A&M. Sydney Carter hit a 3-pointer with 10 seconds left to lift the Aggies. Gemelos, who entered the game averaging 11.6 points and a team-high 8 rebounds, was injured as she drove the lane 3:37 before the break. She writhed on the floor beneath the basket and sobbed in the hushed arena. It was Pat, the Lady Vols say, who restored the confidence of Simmons, a frenetic young guard who was in the grip of a bad slump. In the days before the Rutgers game, Pat corrected her shooting motion in individual teaching sessions and kept a consistently comforting arm around her — while refusing to tolerate any pouting. The result was a timely, explosive performance. “Pat had a lot to do with those shots,” Spani says. The light went on for Simmons just in time. “Hallelujah,” Pat says. It was a gratifying comment. Pat has worked for four years to instill her brand of fight in the senior class, a group led by Stricklen that has failed to reach a Final Four, and in the past exhibited a lazybones quality, but no more. Pat used to tease Stricken about her lack of intensity and complained she would rather sit by a pond with a fishing pole back in Arkansas. But against Rutgers, Stricklen went 40 minutes without a blow, led the team in scoring, provided lockdown defense grabbing three steals, and played so hard her calves cramped in the final minute. Cal came so very close to beating #14 Ohio State today, but they fell short and the Buckeyes won 77-75. Tomorrow is the big UConn-Baylor matchup, and it'll be in Waco, where Kim Mulkey rules the roost. Who will win? "Guru" Mel Greenberg has a good point: rookie coaches aren't finding it easy going this year. 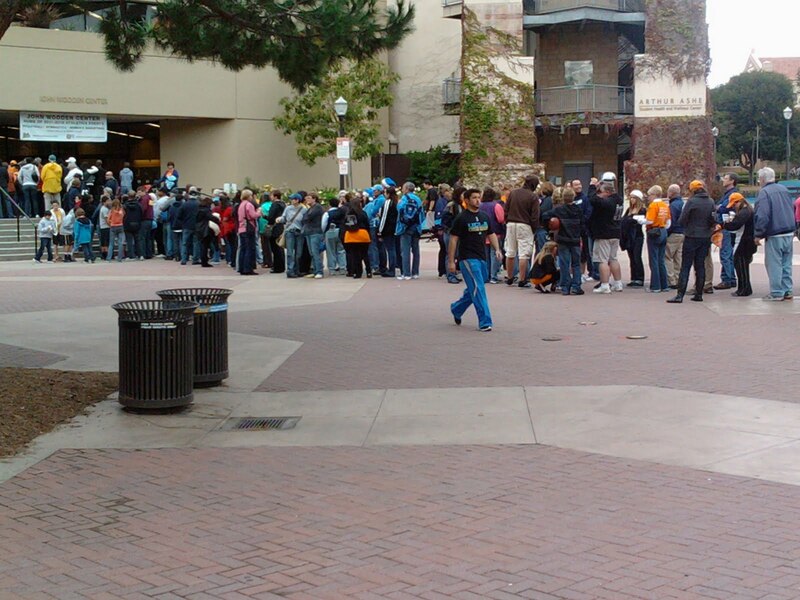 The line to get into the John Wooden Center extended far to the right of this shot, around IM in OC, who took the picture, and then snaked to the left. My numerous photos of this great game and exciting day are HERE, so feel free to consult them as I narrate. The sold-out crowd showed up an hour or more before the game to stand in line at the small John Wooden Center. There were a lot of UCLA fans, but there were more orange-wearing people than blue-wearing. I didn't know there were that many Lady Vol fans in Los Angeles. And they donned all kinds of Tennessee gear, from T-shirts to sweatshirts to hats to orange "we back Pat" shirts. They were a little late opening the doors for us, but once they finally did, the crowd flowed smoothly into the arena. We got to see both teams stretch and then warm up. As in 2007, when Tennessee played UCLA here before, the Vols greatly out-sized the home team in height and stature. When Coach Pat Summitt walked in, the crowd stood and applauded. She smiled and gave them a "thumbs up" sign. The Bruins began the game attacking on defense, but it did them no good as the Vols made 18 of their first 20 shots. Eventually they missed a few more, but still ended up shooting 76 percent for the first half. Tennessee's only fault was that their defense wasn't up to its usual snuff. Associate head coach Holly Warlick had been leading timeout talks, as she has done since the beginning of the season. At a 14:11 timeout, ahead 17-8, Warlick had assistants Mickie DeMoss and Dean Lockwood in discussion when Summitt whirled around to the team and yelled at them for a few sentences. It was nice to see; just like old times. UCLA never gave up. They cut the lead to 24-20 at 10:34 in the first half. Tennessee went on a run to go up by 16 with just under six minutes to play, but the Bruins fought back and narrowed the gap to 34-45 at the break. Junior Rebekah Gardner was especially impressive, putting up a career-high 24 points, including 15 in the first half. They played hard until the final buzzer - a respectable showing. The Vols missed their last shot before halftime, following a sloppy offensive stanza. As the buzzer sounded, Summitt turned around to UT media relations wizard Debby Jennings and said "ugly." So you know what happened at halftime. And predictably, Tennessee came out swinging, and went on a 9-2 run to pull away for good. The closest the Bruins were able to get was 13 points with 15:50 to play. Meighan Simmons lead the Vols with 18, while Glory Johnson added 17, Vicki Baugh and Taber Spani each 14, and Shekinna Stricklen put up 11. After Gardner for the Bruins, Markel Walker and Thea Lemberger each added 11 and Antonye Nyingifa had 10, before going down late in the game and not returning. She emerged afterwards on crutches with an ice bag on her knee. No word yet on the UCLA website as to the extent of her injury. Game story from the Associated Press. - I sat right behind the bench. Heaven. - Stricklen seemed to be feeling sick late in the first half. She was taken into the locker room, where she stayed, but she came back to start the second half and jumped right in. - The Tennessee entourage is pretty amazing. There are four coaches, the media relations rep, the director of basketball operations, the athletic trainer, the strength coach, the radio guy, and three young assorted water/walk-you-to-the-locker-room attendants. They also come with two stools (see photos) and several big bags worth of game stuff. - Baugh is incredibly poised on court. She has grown a lot the last few years. - The Vols have defensive plays with hand signals the same as all teams do with offense. They are really serious about their D. And they talk to each other on defense a lot, as well as scream at their opponents. Johnson is particularly good at the latter. - I'm still getting used to associate coach Holly Warlick conducting timeouts. She's excellent at it - don't get me wrong. It's just something I and the University of Tennessee have never seen before: someone else leading the huddle for the Lady Vols besides Summitt. - I'm really proud of UCLA. They're out there playing their asses off, and they're doing better than fans expected them to do. They have a lot of heart, a lot of will, and they play together as a team. They're doing a hell of a job considering the teammates they're missing, and next year once those bigs are back, the Bruins will be major contenders again. - Summitt and assistant coach Mickie DeMoss came out after the game to do the post-game interview with the Tennessee radio guy (who is very nice, by the way). Fans completely circled the area and everyone pulled out cameras; it was so Hollywood. Then when Summitt got up she was mobbed by autograph-seeking fans, who she generously obliged until the director of basketball operations began shutting it down and guiding Summitt toward the door. I talked to her for a moment myself, which made my entire year. - I think one of the major reasons Tennessee has been so successful over the years is that the team and staff operate like a family. It's really apparent sitting behind them and watching them interact. What do you get when you put Marcel Sanders and Ricky Blackmon together? A lot of great coaching. Tennessee is in Los Angeles, and will play UCLA tomorrow and Stanford on Tuesday. One news source says the Lady Vols have been making adjustments on the fly. Scout.com members can read Maria Cornelius' preview. (Update at 10 p.m.): The Lady Vols are happy to see Alyssia Brewer, and the John Wooden Center is tiny. Tyler Summitt's letter in support of his mother Pat Summitt's Foundation. The Nike Tournament of Champions begins Monday in Phoenix, Ariz. Brackets are here. The Smith Division is tops, and the Anderson Division follows. ESPN has a Smith Division preview and an Anderson Division preview, as well as a visitor's guide. I will be at tomorrow's Tennessee-UCLA matchup, though not in an official media capacity for hoopfeed.com, as I usually am. This is because the UCLA Athletic Department doesn't credential website media. (They are the only college or pro team I've come across that has this policy). If I were in my usual reporting capacity, you better believe I'd bring you the best Pat Summitt interview ever. But I'll do the best I can with my sideline reporting.....you all know I watch everything. ESPN will have the rights to broadcast the NCAA Tournament through the 2023-2024 season, thanks to a new agreement. Former NCAA vice president Sue Donohoe has been named executive director of the Kay Yow Fund. The petition against stipends for NCAA athletes reached 125, so the governing body is putting the proposal on hold. #1 Baylor and #2 UConn face off Sunday. ESPN's Mechelle Voepel wonders if this is the next big basketball rivalry. Coaches Kim Mulkey and Geno Auriemma speak. Kara Lawson breaks it down. The Tennessee Lady Vols arrived in Los Angeles a couple hours ago, in preparation for their game Saturday against UCLA (YEEAAAAAAHHHHHH!!!!!!) They are not planning to "freak themselves out." Dishin & Swishin has a cool conversation with Nnamkadi and Chiney Ogwumike and Ros Gold-Onwude about hoops and Nigerian heritage, among other things. At Wisconsin, it has been a slow start to the Bobby Kelsey era. Former Washington State Cougar Ki-Ki Moore has made an immediate impact for Fresno State. UCLA-bound Nirra Fields, ruled ineligible a few weeks ago, will get to play this season after all. The Mater Dei guard's hardship application was approved by the California Interscholastic Federation's Southern Section office. Ninety-seven schools have signed a petition against the NCAA's plan to give athletes a $2,000 stipend. Love this piece about Missouri player's various pre-game rituals and routines. ESPN's Graham Hayes notes that Tennessee's work on offense last night was particulary impressive for a team that's always been defensively-focused. Trailing 54-51 with 8:33 left, Tennessee (6-2) scored 13 straight points, holding Rutgers without a point for nearly 8 minutes. Vicki Baugh started the burst with a layup and Simmons hit consecutive 3-pointers to give the Lady Vols a 61-54 lead. Taber Spani hit another 3 with 1:52 left to seal the victory. Tennessee game notes (with a great picture) and quotes. As noted in the first story, and by all the journalist tweeters I follow, Tennessee Coach Pat Summitt got a long standing ovation from the crowd as she entered the RAC. Students were also selling bracelets to support her foundation, and Rutgers players emerged for warmups in "we back Pat" T-shirts. It's the most touching thing I've seen in a while. I'm still getting used to associate coach Holly Warlick standing and coaching a lot during games, but she is a chip off the old block, and does her job well. In the meantime, LSU put the hurt on UCLA and beat them 58-41. Tamika Catchings has a new website. "I've been out of school for 12 years, and I go back and it's the same people," said Holdsclaw, the program's all-time leading scorer and rebounder who has a street near the arena named after her. "It's like I haven't even been gone for a day. You still feel that support you felt when you were a student there." San Diego State basketball dumps the Mountain West Conference for the Big West Conference in two years. I couldn't be happier. The move follows Aztec football's jump to the Big East Conference. Cal State Northridge has a new dynamic duo, and they're a pair of super-freshmen guards: Janae Sharpe and Ashlee Guay. Tomorrow's feature game will be #8 Tennessee at #11 Rutgers - a series that has much tradition. UCLA is in Louisiana and will take on LSU tomorrow night, too. For all the significance of this game, it's curious that neither team mentions it on their respective websites. Check out this video and tell me you don't want to be part of the Cal basketball team. One of the star teams of next week's Nike Tournament of Champions features a pair of old friends. Murry Bergtraum team "doing it for Chicken"
The players resolved to dedicate the season to Ms. Murphy and to rename their winter tournament the Tayshana “Chicken” Murphy Memorial Classic. They added the name Chicken to their practice jerseys. ....For Shequana Harris, who emerged as a quiet team leader, too much was in flux. On Oct. 11 she made an early commitment to the University of North Carolina at Charlotte. She said the killing had a lot to do with her decision. In November, Ms. Coe lost another friend, Shaquille Jones, a male basketball player who was shot in the head after school in Canarsie, Brooklyn, apparently caught in a dispute between two groups of teenagers. ....Mr. Grezinsky said Ms. Murphy’s death sometimes kept him up at night. A true blessing: Katie Collier, the top-ranked Seattle recruit who was fighting leukemia earlier this fall, has been cleared to play. The senior, who attends Seattle Christian and signed with the University of Washington last month, made her comeback this past Friday. She scored 13 points. I'd like to give her a Maggie Dixon Courage Award, too. A great day at Madison Square Garden today, for the Maggie Dixon Classic. St. John's made #1 Baylor work in the first game. The Bears struggled in the first half, and trailed by two at the break. They began to pull away about midway through the second half, and prevailed 73-59. Brittney Griner was limited to 17 points, and I felt that was due to the way the Red Storm clamped down on both her and point guard Odyssey Sims. ESPN's Graham Hays had the same thoughts. During a timeout in the game, Tennessee Coach Pat Summitt was brought on court and presented the Maggie Dixon Courage Award. Then in the next game, Summitt's Vols took care of DePaul, 84-61. Rebecca was there, and has all the great behind-the-scenes stuff. One upset today: Central Michigan defeated #14 Purdue. It's the Boilermakers' second consecutive loss. #23 Oklahoma ended a three-game losing streak by beating Milwaukee. Results of today's other 54 games are here. Associate head coach Jim Littell will be Oklahoma State's head coach, the University has announced. He has been interim head coach since the Nov. 17 death of Coach Kurt Budke, and assistant coach Miranda Serna. OSU Athletic Director Mike Holder said Littell has been "a rock" for the program. Unbelievable: the entire Kenmore East High School basketball team has been suspended due to their repeated use of the N-word in practices and before games. The lone black member of the team had been upset by the practice and was suspended after hitting a teammate who had called her "a black piece of s#$@." Should their season be canceled? What do you think? Tennessee starting point guard Ariel Massengale sustained a dislocated finger in practice yesterday, and will be out 2-3 weeks. I'm bummed - was looking forward to seeing her when the Vols play UCLA next weekend. "He puts a lot of time into everything he does," says McGuff, who has worked with Neighbors for five seasons, the first four at Xavier. "When he scouts an opponent, he doesn't just do a general scout. He tells you what they're doing and also what they're trying to accomplish. Then, he takes it to the next level and says, 'Here's what I think we can do against them.' His ability to think about the game on multiple levels is very important." Neighbors' routine is always the same. He is too superstitious to deviate. He also stays consistent because it makes him more efficient. He studies the opponent's statistics first. Then he watches the opponent four times before writing any notes. When it's time to take notes, he uses the same instruments — purple pen, black pen and two sharpened pencils — and writes on the same kind of legal pad, a Docket Gold Pad. "If you have a routine, you don't waste time," Neighbors says. "Every 10 or 15 minutes saved is 10 or 15 minutes of film that you can watch." #10 Kentucky beat #5 Duke 72-65, in front of the largest home crowd for a women's game in Kentucky history. Moments ago, Fresno State upset #23 Oklahoma 69-66. With their victory tonight, Baylor has won 28 consecutive home games. The Maggie Dixon Classic and Green Bay are among Dishin & Swishin's topics this week. Author and educator Pat Griffin reflects on Tayshana Murphy's death. Some serious drama in Mississippi this week, as top 2012 recruit Rachel Hollivay left her Heritage Academy high school team, and Coach Yolanda Moore was fired. A reported "cussing exchange" between coach and player last night lead to the circumstances. Hollivay, who recently verbaled to Rutgers, is ranked eighth in her class and second at the post position. Last year's champion North Idaho College is 18, while runner-up Trinity Valley is ranked first. Who will take the title this year? The Big East added five more schools today: the University of Central Florida, the University of Houston, Southern Methodist University, Boise State and San Diego State. BSU and SDSU will only participate in the sport of football. Women's basketball will remain in the Western Athletic Conference and Big West Conference, respectively. Is the future now questionable for the Big East? National high school player star watch - and they're not all seniors. Legendary Coach Pat Summitt received the Sports Illustrated Sportswoman of the Year Award tonight in New York. She was introduced by former Vol Michelle Marciniak, whose remarks brought a standing ovation from the audience. Summitt's son Tyler also spoke. Summitt will have to write another speech, however, as the NCAA will honor her with the Gerald R. Ford Award. It recognizes those who "have provided significant leadership as advocates for intercollegiate athletics over the course of their careers." 1. Nazareth - Brooklyn, N.Y.
2. Saint Mary's - Phoenix, Ariz.
3. Riverdale Baptist - Upper Marlboro, Maryland. 4. Spring Valley - Columbia, S.C.
5. Saint Johns College, Washington D.C.
6. Bolingbrook - Bolingbrook, Ill.
7. St. Mary's - Stockton, Calif.
8. MacArthur - Irving, Tex. 9. McEachern - Powder Springs, Geo. 10. Mater Dei - Santa Ana, Calif. Inspired recently by a list of "coaches to watch out for" by a large media outlet, I asked one of the Division I assistant coaches I respect most to come up with a more thoughtful and in-depth list. Because while I greatly appreciate Pat Summitt, Dawn Staley and the other coaches on the media outlet's top 10, who doesn't already watch out for these stars? True fans of the game will appreciate this coach's knowledge of the national coaching scene. He chose mid-major coaches, and he wrote everything except for the "Pacific" section, which he deferred to me. Feel free to comment. Women’s basketball does a tremendous job of promoting its star program and coaches, but often the mid-major conferences and their coaches are often overshadowed. Here we highlight some of the bright up-and-coming coaches who do an outstanding job from mid-major leagues, which typically only get one bid to the NCAA Tournament. Here is a quick look at up to three of these coaches, in each region of the country, that women’s basketball fans and media that will want to follow this year. This isn’t a "who’s best" or "who’s worst" list; it's just a reminder that some of the best coaches aren't named Tara, Geno or Pat. Each of the coaches on this list do an tremendous job with their programs, and we will all want to keep an eye on them as league play begins in December and January. After a 9-20 start in her first year at LIU, Striegler re-engineered the Blackbird program with seasons of 19 and 22 wins and a trip to the NEC championship game. Coaching at a high level is old hat for a program builder like Striegler. Known as an excellent tactician at Central Florida, she lead UCF to three consecutive Atlantic Sun championships from 2003-2005 and was named Atlantic Sun Coach of the Year in both 2003 and 2005. With back-to-back Ivy League championships and 20+ win seasons, Banghart and her Tigers are beginning to assert a strangle hold on the Ivy League. A former Ivy League player herself (Dartmouth), Banghart not only understands what it takes to be successful in the Ivy, but she’s lived it. Expect a third championship this year and at the rate Banghart has the Tigers recruiting, more to come. The former Penn State star and assistant coach, Robinson Fruchtl with her strong Pennsylvania ties, has kept the Red Flash program rolling along. After guiding Saint Francis to its first NEC Championship game appearance in three seasons in 2008-09, Robinson Fruchtl's squad returned back to top of the NEC last season. As long as Robinson Fruchtl is at Saint Francis, expect the Red Flash to be competitive in league and frequent trips to the NCAAs. With nearly a quarter century of experience in coaching and having worked for Pat Summitt and Kay Yow, Glance isn’t exactly a newcomer to the coaching scene. However it is only her first coaching gig and Glance is showing she’s very capable of piloting a ship herself, guiding the Redbirds to a 24-11 record in her first season in 2010-11. Having a savvy veteran who knows how to run a program from top to bottom at the controls will give Redbird fans a chance to win “The Valley” every year. 30 win season? (31 in 2006-07) Check. Multiple conference championships? (Seven) Check. All Miller does is win in one of the most competitive mid-major leagues in the country. Upon taking the reigns of the Falcons program, Miller energized the BGSU and hasn’t looked back. Though not known by the casual fan, Bowling Green is annually considered one of the best mid-major programs in the country and we’ll include him on the “up & coming” list because he most likely mid-major coach to be a on the speed dial for a BCS AD looking to improve its women’s basketball program for a vacancy in the spring. Prior to this year, a 251–53 record and four straight post-season appearances make UWGB’s Matt Bollant is definitely one to watch. A stickler of the fundamentals game, Bollant may not have BCS level athleticism at his disposal, but his focus on intelligent play within his version of motion offense has turned UWGB into one of the toughest tournament outs each year. In addition, hiring former Idaho head coach Mike Divilbiss has not only pushed the Phoenix into being a stingy defensive team but also shows that Bollant is comfortable in his own skin and secure in his own coaching abilities by hiring another former head coach as an assistant. Telegenic personality and recruiting ace Jackie Carson has Furman on the move, and quickly. After taking over a program with five straight losing seasons, in year one, Carson doubled its overall win total and upped its league victory tally from four to ten, while jumping from eleventh to fifth place in the league standings. However, the biggest area of improvement for Furman: Recruiting. Carson has notched several high profile recruits for both this year and next. And a narrow one-point loss to instate and ACC foe Clemson earlier to this season is a testament to where the program is headed. A sought out clinician on his unique blend of motion offense, Smesko has navigated Florida Gulf Coast from DII waters to instant success in the Atlantic Sun. The two-time and current A-Sun Coach of the Year, Smesko also has led FGCU to the 2008 D-II national title game, two A-Sun regular-season titles (including last season) and four WNIT berths. Since entering the league, the message is clear, FGCC is always among the teams to beat. After a bumpy start full of injuries, Louisiana native, Donald-Williams has rebuilt the McNeese State into a Southland power. The Cowgirls were 26-7 overall record, 15-1 Southland Conference record and an undefeated home record (15-0) last season, an overall record that matched the best turnaround in NCAA history following a 7-22 overall record in 2009-10. Expect for the experienced Cowgirls to dancing again in March and a fixture in mid-major polls for years to come. After making the move from a successful four year run at UNC-Charlotte (86 wins in four seasons with a school-record 27 wins this last year), Aston is beginning her magic with the Mean Green. A former North Texas Assistant, Aston has already to begun to right the ship at UNT in her first year, already surpassing last year’s win total of 5 by 6 wins. Want evidence of Aston’s coaching prowess? In four seasons at Charlotte, she led them to two 20-win seasons, the 2009 Atlantic 10 tournament title, a 2011 WNIT Final Four appearance, one NCAA Tournament berth and three WNIT appearances. Daniel wasted no time in making the Sugar Bears relevant in its short tenure in Division I. After an initial season of 6-23, Daniels has posted records of 21-8 and 21-12. Doing more with less, UCA has beaten a SEC, Big 10 and Conference USA foe in only two short years from a 6-win season and now is a perennial threat for a Southland Conference title. The Sugar Bears have been placed in good hands with the Arkansas native who knows the state and recruits extremely well. Three years ago, UT-Martin only managed two wins. Enter Kevin McMillian. With a revamped roster, McMillian moved UT-Martin by year two and with a team that was the youngest team in the country (Most players with only two years of Division-I experience heading into the season), to a 21-11 with a 14-4 record in the OVC. And in many cases it wasn’t even close as a dozen of UT Martin’s wins were by double-figures, including six victories by 20 or more points en route to capturing the program’s first league title. McMillian, a long time successful high school coach in Tennessee, is proof positive that he can flat out coach at any level. With a last name like “Six” we ask you to consider simple math. Two years + More than 40 wins = Pretty successful way to start a career. Six has guided the Lady Pirates to two straight 20-win seasons (the first time in program Div. I history), the MEAC regular-season title and a second straight MEAC Tournament crown in his short time at the helm of the Lady Pirates program. With long ties to the Tidewater area, the former high school coach as energized a program and taken it to new heights with the best yet to come. Pemper has overseen a massive rebuilding job at Navy. She inherited a program after an eight-year span where the program had produced one winning record, no winning seasons in Patriot League play, placed no higher than fourth in the league standings and posted just one victory its conference tournament. Pemper has guided Navy to winning marks in the Patriot in each of her first three seasons, culminating with a 2010 Patriot League title and first NCAA Tournament appearance last year. Also to consider, in addition tremendous work at Navy, Pemper coached at DIII Bowdoin, amassing an a absolutely staggering 235-48 record and a career winning percentage of 83 percent (fourth in NCAA Division III history). Stern, the reigning America East Coach of the Year, led UMBC to a 20-12 season in his last campaign, matching the school record with 20 wins – the most in the program’s 25-year Division I era – and its 13-3 mark in league play was its best in eight seasons in the conference. What’s set Stern apart is that he adapts to his personnel; willing to install styles of play as different and diverse ranging from a Princeton/Triangle hybrid offense to an up-tempo fast break scheme of play. Don’t be fooled by this year’s 3-4 start, UMBC’s currently playing without three starters for the moment and those who’ve followed Stern know he’s one of the most adaptable coaches in the business. His willingness to fit what works, makes UMBC a difficult team to prep, a threat for the America East each crown each year and a makes Stern a mid-major coach to watch for this season. Johnson has done a masterful job with the Pioneer program boasting a 65% winning percentage in league play in just three years time as the headman in the Mile High City. Often considered one of the best mid-major X & O coaches, offensive creativity as a coach is where Johnson really shines. Johnson's teams are deadly efficient, with the 2010-11 version finishing the season ranked tenth in the nation field-goal percentage and in the top 25 nationally in 3-point field goal percentage. Tack on a win over top 25 and SEC stalwart Vanderbilt last year, and it’s evident that the Pioneers are moving in the right direction. Former WNBA player, Tricia Binford took over a program whose goal was to be in the Big Sky Conference title hunt every year. Mission accomplished. Under Binford’s leadership the Bobcats have played for the Big Sky title twice in the each of the last four seasons and have made five straight postseason appearances. In the always competitive Big Sky Conference, expect the Bobcats already with a strong 7-2 start (with losses to only BCS schools), threaten to take the leagues automatic bid in the spring. Jason Flowers last year stepped to the helm of a program that had lived at the bottom of the Big West Conference for the better part of 10 years. Four years ago, the Matadors won only one game all season. But Flowers came with a vision, a set of exceptional assistant coaches, and a great work ethic. He landed some major recruits, and has successfully developed the players he did have. While CSUN is still having trouble finishing games in Flowers' second season, their improvement in every area is striking, if not stunning. So far this year, the Matadors are tied for second place in the Big West. ESPN says this year's Nike TOC will showcase the strongest field ever. #9 Miami needed two overtimes to take out #12 Rutgers, 92-81. She of 1,075 wins - the most of any college coach ever - wins Sports Illustrated's sportswoman of the year award in 2011. #16 Purdue handed #4 Texas A&M its first loss, 60-51. #10 Kentucky dominated #11 Louisville from jump, to the tune of 74-54. #18 Ohio State started strong and never looked back, beating #18 Oklahoma 69-63. #8 Tennessee held off #22 Texas, 73-57. In #5 Stanford's drubbing of Fresno State, both Nnemkadi and Chiney Ogwumike had double-doubles. Oklahoma State defeated Indiana on the road, 83-72. They are off to a surprisingly strong start. With their victory over William and Mary today, Delaware is off to its best start ever, at 6-0. UCLA routed Loyola Marymount today, winning their third consecutive game. Cal thrashed UNLV 70-48 to win the Cal Classic. Bear freshman Reshanda Gray put up 23 points and was named the tournament MVP. Kansas endured its first loss of the season, to Alabama. Spokane, Wash. - USC went on a 13-2 run in the last five minutes of the game to beat Gonzaga 58-51 at home, snapping a 32-home game winning streak. Ashley Corral lead the Trojans with 19 points, while Briana Gilbreath added 13, and Jacki Gemelos chipped in 14 rebounds. Kelly Bowen was the high-scorer for the Bulldogs, with 15, and Haiden Palmer had 13. Gonzaga lead 49-45 with 5:20 to go, when USC Coach Michael Cooper called a timeout. After that, the Trojans went on their run to close out the game. 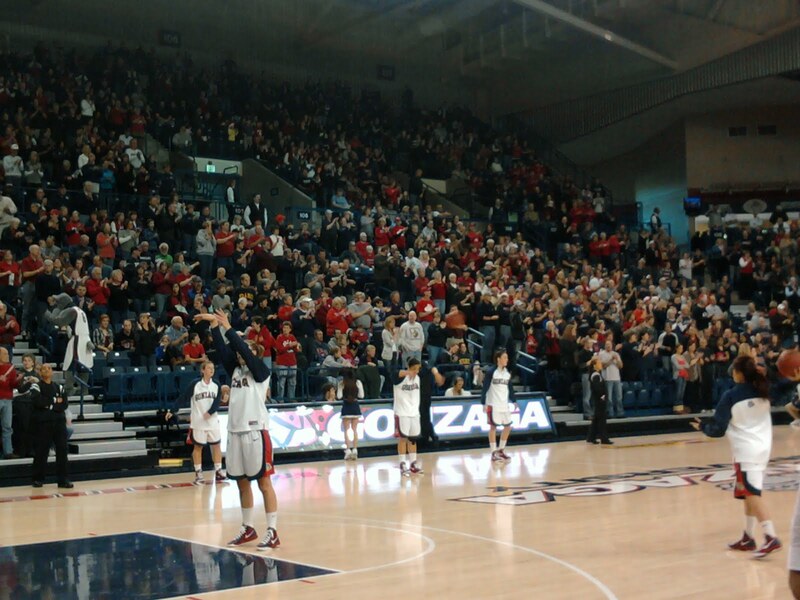 Zags fans stand and cheer their team during warmups. The game was a near sell out with only the last row empty. This fan support and intensity is what women's basketball is all about, says IM in OC. USC guard Jacki Gemelos (#23) looks for Cassie Harberts under the basket. The team gathers around Coach Michael Cooper during a timeout. Trojan forward Briana Gilbreath, at far left, begins to run the ball in the second half. As of right this minute, here's where things stand.....who would have thought? That Too Tall kid is pretty good: freshman Reshanda Gray's double-double propels Cal into the finals of their own weekend showcase. They play UNLV at 2:30 p.m. today. There are 14 games today featuring top 25 teams. One of the most intriguing will be #10 Kentucky vs. #11 Louisville. Another hot contest will be #17/18 Ohio State at #18 Oklahoma. A third big match up is #8 Tennessee vs. #21 Texas. Texas relies on their guards for offense. Vol freshman Cierra Burdick is committed to improving on defense. Brea Olinda passed their first big test of the season last night, winning the Ladycat Classic. Fun game to watch last night: my story and photos. Fullerton is young but tough, and they never give up, which I like a lot. Gonzaga seems a little wobbly without a true point guard, but they have so much talent that it's only a matter of time before they sew it together. Recap of last night's action, including Tulane beating Louisiana Tech and North Texas overcoming Oregon State. Orange County high school season preview. After all that Thanksgiving weekend tournament and game action, things have been a little quiet the last few days, and that's OK. But as was said in a movie not too long ago, there's never nothing going on. Tammy Sutton-Brown is now an author - of children's books. In the midst of #6 Duke beating #16 Purdue last night, Blue Devil Elizabeth Williams set a freshman record for rebounds with 17. Stanford is experiencing growing pains. Dishin & Swishin talked to Natalie Novosel, Tiffany Hays and Caroline Doty. Tonight I'm going to check out the Gonzaga-Cal State Fullerton game.....report later. UCLA overcame both a staffing and size deficit last night to beat visiting San Diego State 78-71. Antonye Nyingifa lead the Bruins with 21 points, and Rebekah Gardner added 20. 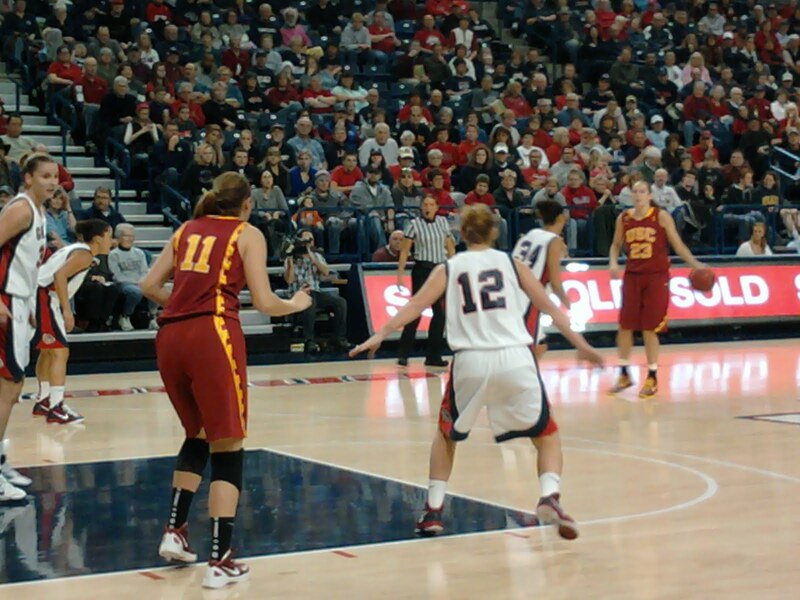 Courtney Clements led the Aztecs with 19 points, while Melissa Sweat put up 14. SDSU was ahead 8-4 by the 16:04 mark, but UCLA went on a 13-0 run over the next four minutes to lead 17-8 at 12:02. They continued their climb, and were up by as many as 16 points more than midway through the half. But the Aztecs began a run of their own in the closing minutes, slashing the deficit to 31-38 at the half. They continued their run in the second, and tied the score at 39 two minutes into the period. But about halfway through, the Bruins clamped down and began pulling away. Ahead by eight points at the 9:45 mark, they never looked back. Both teams each now have 4-2 records. SDSU is a tall, physical team with a lot of athleticism. They are using four freshmen who scored 20 points between them against UCLA. They also have junior guard Clements, who can score both inside and out. Chelsea Hopkins, the junior transfer from Duke, is an extremely capable, agile point guard with excellent court vision and instincts. Aztec Coach Beth Burns took the team to the Sweet 16 in 2009, and has been rebuilding ever since. Now it looks like her plans are beginning to take shape. This young team is one to watch. They are good, and are only going to get better; the writing is already on the wall. UCLA currently has a seven-woman rotation: Nyingifa, Gardner, Mariah Williams, Thea Lemberger, Corrine Costa, Moriah Faulk, and Rhema Gardner. Nyingifa and Gardner are doing a great job leading the team, much like Doreena Campbell and Darxia Morris did last year. Williams and Lemberger have stepped up their games - both of which were weak. So has Rhema Gardner. Faulk is the only active freshman currently, and she's the real deal: a fearless slasher who can also shoot the three. James Ybiernas, UCLA assistant sports information director, said Markel Walker has been out after having thumb surgery, and hopes to be reactivated in time for the LSU game in two weeks. Kacy Swain sustained a concussion in Friday's game against West Virginia, and is listed day-to-day. Both Alexis Perry and Jackie Shepard had off-season shoulder surgery, and are out indefinitely. Jasmine Dixon is out for the year, and Alyssia Brewer is sitting out one year as per NCAA transfer rules. The situation is really no different than it has been for the last two years, as UCLA's bench was so weak it was like having only 7-8 active players anyway. The difference now is that the Bruins have more offensive structure, thanks to new Coach Cori Close. First West Virginia sued the Big East Conference so they could move to the Big 12. Then the Big East counter-sued them. Now WV is seeking to have that suit dismissed. League realignment has messed up scheduling, says Purdue Coach Sharon Versyp. The Washington Huskies have found a team leader in Regina Rogers. Rutgers Coach Vivian Stringer has high praise for senior point guard Khadijah Rushdan. Maryland point guard Anjale Barrett is a quiet weapon for the Terps. I wondered at Andrea Riley's silence since the deaths of her former coaches Kurt Budke and Miranda Serna. The point guard says Budke believed in her before she believed in herself. She is dedicating "everything she does" to Budke and Serna. The usual suspects, but exciting nonetheless. Sylvia Fowles took time to visit and speak to the UCF team, as a favor to her former coach Bob Starkey. Florida Gulf Coast scored a whopping 21 three-pointers in their win against Webber International last night. They tied the NCAA record for treys in a single contest. LSU, at 3-3, is taking a break and won't play again until Dec. 11. Duke starter Shay Selby has been suspended indefinitely for a violation of team rules. On the clock with UCLA freshman Kacy Swain. Miranda Serna was laid to rest Saturday in her home state of New Mexico. So far, an investigation has revealed that the plane banked to the right and then dipped before crashing and killing all aboard. Baylor has adopted a child. Former University of Nevada guard Tahnee Robinson will be a an official spokeswoman for Big Brothers Big Sisters. ESPN has tagged six seniors as players to watch this season. Andrew Moritz, who played for the Washington Huskies, died from cancer yesterday at age 33.